We offer quality, certified sputtering targets that have been manufactured using the latest improvements in Hot Isostatic Pressing and Vacuum Hot Pressing. Our international partnerships with leading material transformers and manufacturers of targets enable us to offer the greatest variety of cathode sputtering targets for thin film deposition. You can combine the composition materials of pure metals, alloys and composites with sizes, shapes and degrees of purity to satisfy your thin film objectives. 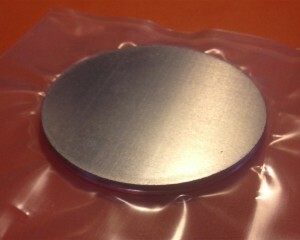 Circular, rectangular, triangular, flat, S-Guns electrode, or any other shape desired can be supplied to fit all leading manufacturer Physical Vapor Deposition systems, or your custom made bench top sputtering equipment. The manufacturing process undergoes quality inspection in all stages. 100% of our targets go through a final composition, shape and size lab analysis. The Inspection & Analysis Certificate is shipped with the target. Send us your sputtering target specification to get a quote, and we will get back to you in less than 24 hours.